Today, there is a new exciting release from Barney! Make sure to pick up the Barney: Story Time with Barney released today! Reading is fun and opens doors for imaginations to soar with magical tales of fun and adventure in the all-new Barney®: Story Time with Barney! Trusted by moms and adored by children, Barney displays sharing, caring, imagination, dancing and learning on television, online and through live events, home entertainment, toys and publishing. In 2013, Barney is celebrating over 25 years of love and friendship with the Barney 25 Million Hugs campaign. Barney is inviting fans of all ages to help him reach his goal of sharing 25 million Barney hugs around the world through the site www.ShareBarneyHugs.com and via email, Facebook and Twitter. 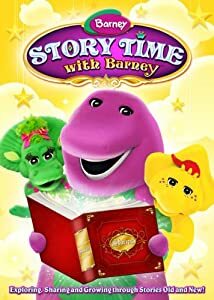 Win It: (1) Barney: Story Time with Barney DVD to a lucky winner!